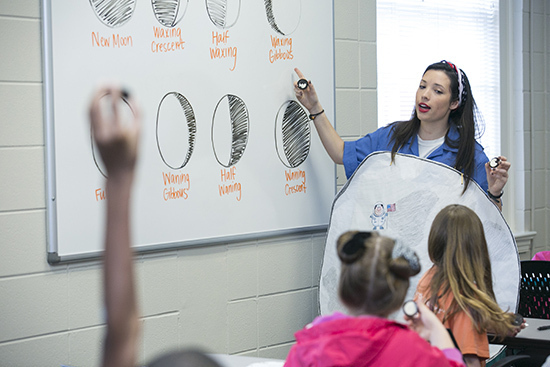 The event was hosted by Samford’s teacher education students, who planned various learning activities throughout the day including a special visual presentation in Samford’s Christenberry Planetarium. The Space Day event begins a week-long study of the solar system for the students at Trace Crossings Elementary School in suburban Hoover that ends with a trip to Space Camp in Huntsville, Alabama. Teacher education candidates spend significant amounts of time in Trace Crossings classrooms teaching lessons and assisting children as part of a K-12 school-university partnership with their teacher education preparation. The partnership allows students to learn by becoming immersed in the elementary school culture.